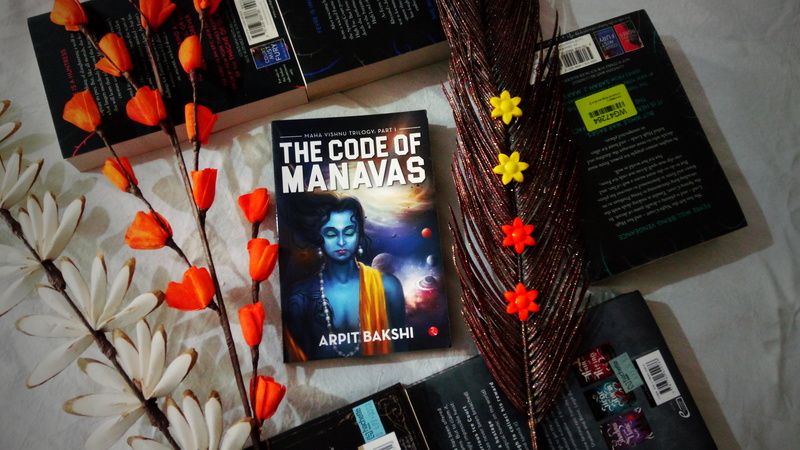 The Code of Manavas, is set some two million years past ad 2050, when earth as we know it ceased to exist and so did mankind. A new race, the Manavas, now exists on Bhoomi, the erstwhile Earth, which is divided into two cities—Madhavpur and Ayudhpur. In the quiet and peaceful city of Madhavpur, a reclusive Krishna is busy with an immense task. He has to prepare a new abode for the Manavas before an impending apocalypse destroys them. He knows something that nobody else does—the Manavas are running out of time faster than they can imagine and there are no inhabitable planets to escape to. To make matters worse, there is someone in Madhavpur who wants to destroy Krishna and subjugate each Manava. The Manavas, it seems, are doomed. Yet Krishna knows there is a slim chance of survival for the Manavas, although there is a huge price to be paid for it. Will the various factions of the Manavas unite for the greater good? Will Krishna, who saved them during the turn of the last Yuga, be able to save them now? What will be the price to pay? Enter the mythical world of Maha Vishnu and get swept up in a fast-paced suspenseful narrative. I would like to thank the https://www.instagram.com/thatinsomniac.reader/ and author for the review copy . My review here is unbiased and honest. The story set way ahead of million years itself gives an interesting plot to the readers. The book mainly revolves around science and technology which lights up the creative side of our mind. Krishna and the fellow Manavas lives in Madhavpur who are basically immortal because of the component Bhoomidium. Manavas believes in science and works into it. whereas Ayudhpur inhabitants believes in God and nature. They have a treaty not to disturb each other. But soon bhoomidium starts to deplete which makes the bhoomi plates to be unstable. Krishna with the help of unknown source finds another world Prithvi and creates life source growth in it. Krishna plans to migrate before the catastrophe hits. Will Krishna succeed ? What stands infront of him to achieve his task? The book totally falls under sci-fi and hence there are lot and lot scientific terms which at time makes hard to get into the story. Krishna though seems serious in his work but stays cool and lighten up the plot with his cool attitude. The co characters doesn’t have much to score as the entire plot falls over the shoulder of Krishna’s mission. Then what makes the story interesting? It’s the language and its crispness. A clean explanation about the task and science behind it. The technical terms were recognizable which in turn helps to read the book comfortably without any lag. There might be huge stock for the readers in the next installment. As the story finished with perfect unexpected turn of event. The plot towards the end started to loosen up and lost the charm as it had at the start. I felt bored as Ayudhpur didn’t make much impact with the story even though they saved Madhavpur. Arpit Bakshi has studied electrical engineering and has an MBA in finance from the University of RPI, Troy, New York. He now works for a prominent Indian bank. Arpit had initially wanted to pursue a career in theoretical physics, but ended up opting for engineering (as most students of science in India tend to do). Since his childhood, two things have never failed to amaze him—the vast expanse of the cosmos; and the unfathomable depth of Indian mythology and spirituality. He believes that one should never stop learning and it is his love for science that has gravitated him towards writing this mythology-inspired science fiction. Arpit is based in Gurgaon, India.